Delete Yahoo Account – Right Now! Delete Yahoo Account is an easy process. 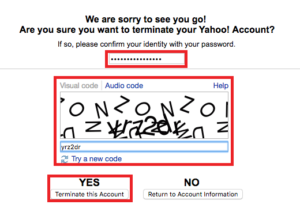 In this page, we have explained on how you can delete your Yahoo account. Remember to backup all the important email and contact before doing delete Yahoo account. Once you delete your Yahoo account, you will not be able to retrace/retrieve any email nor contacts. First of all, open a new window and re-arrange side-by-side to this page, so that you can see the step-by-step process at the same time as you proceed to delete Yahoo account. 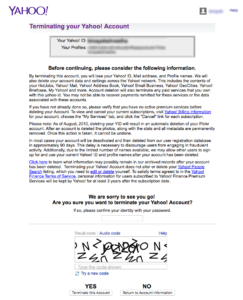 Now, Sign in to your Yahoo account with your Yahoo Email address.How to sign in to Yahoo Account? Once you have signed in to your Yahoo account back up your important email and contacts. To backup email – you can forward to your another email address or copy it or you can also use Yahoo POP mail setup to download it to your Mail app or MS-Outlook. To backup contacts – Export and save them. To backup Yahoo Calendar – Export to iCalendar file format and save it in your computer. Please read the information on the page, after doing so enter password again on the box provided that you can find it right above the flying codes. Its will take ninety days approximately to completely deleted from Yahoo database. If you login in again in your delete account before 90 days its will be activated.